With today’s booming technology scene, there are so many new and different products being created and manufactured everyday. A recent addition to the scene is the touchscreen laptop. But how do you know which one to buy? At Comparaboo, we are constantly scanning the available choices on the market, narrowing it down to the best of the best. This guide will help you learn more about the types of touchscreen laptops that are available, and which one will be best for you. Convertible: These laptops work by utilizing hinge hardware that connects the screen and keyboard. The screen can be folded over, separating it from the keyboard, which then can act as a stand or base. Unlike other touchscreen laptops, the keyboard cannot be removed. The screen sizes vary from 11.6 inches to 13.3 inches. Convertible touchscreen laptops are great for those who want to spend more time using their device as a laptop than as a tablet. Dockable: A dockable laptop is a type of touchscreen laptop that can detach entirely from the keyboard. The screen contains everything the computer needs to be able to work as a laptop. However, the largest screen comes in around 12 inches and because of this size, the hardware may not be as fast. 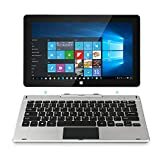 This type of touchscreen laptop is great for those people who want the perks of a tablet, but also the convenience of a keyboard. Sliders: This model features a display that slides over the keyboard. It is similar to the convertible models, but the hinge system only allows for you to slide the screen forward and back. These kinds of laptops tend to be lightweight and small with screen sizes varying from 10 to 12.5 inches. Take note that some of the slider models do not have a trackpad on the keyboard, so all your navigating may have to be done on screen. Standard: A standard touchscreen laptop is simple - a normal laptop that features a touchscreen monitor. 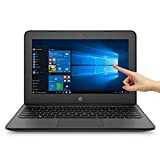 If you want to be able to use your screen for little things (or if you like all the features of a normal laptop and want an interactive touchscreen) this is the one for you. This is also the best touchscreen laptop option for work or professional use. Screen size and sense: The screen should be large enough for you to be able to work on, so this will depend on preference and finger size. The screen should also be sensitive to your touch, and some can be calibrated to your touch. Reviewers especially loved products that had a natural touch interaction. Weight: If you anticipate a lot of traveling a lot with your laptop, the overall weight and hardware should not be too bulky. This will reduce strain on both you and your new gadget. Keyboard: Some touchscreen laptops have an attached keyboard. Many customers like this feature and added that it eliminates the need for a stand. Battery Life: This is an important factor to consider. Look for a laptop that gives you at least 7 hours of use between charges, as this will be most convenient. Keyboard size: Some touchscreen laptops may come with keyboards – but due to the generally smaller size of touchscreen laptops, the keyboards are usually small and may not be efficient for everyday use. Make sure you select a model you know you will be able to use comfortably. Screen size: Make sure the screen size of your chosen touchscreen laptop is adequate for you and does not strain your eyes. Make sure your laptop is easy to store and will fit wherever you need it to go! Protective casing: If you anticipate bringing your laptop around quite frequently, it would be smart perhaps to invest a little bit more into a sturdy protective casing for your touchscreen laptop! It will go a long way to preserving the lifespan of your touchscreen laptop, and ensure its touchscreen features remain functioning optimally. Asus: This company was founded in 1989 in Taiwan by four engineers. It is the world’s 4th-largest computer manufacturer and continues to be recognized for its high-quality hardware and technology. HP: HP, also known as Hewlett Packard, was founded in 1939. With its continual innovation and commitment to quality, HP has created multiple award-winning products and services. 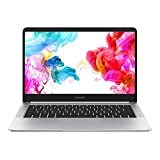 Acer: Founded in 1976, Acer is a Taiwanese multinational hardware and electronics corporation dedicated to the designing, marketing, and distribution of quality electronics.